Peggy Ehrhart is a former English professor with a doctorate in Medieval Literature. Her Maxx Maxwell mysteries, Sweet Man Is Gone (2008) and Got No Friend Anyhow (2011), were published by Five Star/Gale/Cengage and feature a blues-singer sleuth. Peggy is currently writing the Knit & Nibble mysteries for Kensington. Her amateur sleuth, Pamela Paterson, is the founder and mainstay of the Arborville, New Jersey, knitting club. Murder, She Knit and Died in the Wool are now out. Knit One, Die Two is due in May 2019. Three more Knit & Nibble mysteries are in the works. When Peggy Ehrhart was in the third grade at Our Lady of Peace School in the San Fernando Valley, she won a Knights of Columbus essay contest and her fate was sealed. It just took her awhile to realize that what she really wanted to write was fiction. Peggy is a former English professor with a Ph.D. in Medieval Literature. She taught writing and literature at Queens College, CUNY, and then at Fairleigh Dickinson University, taking early retirement in 2002 to focus on writing fiction and playing guitar. Her academic publications include many articles on medieval literature published in scholarly journals, as well as a book, The Judgment of the Trojan Prince Paris (University of Pennsylvania Press, 1987). This book won the Choice award for best academic book. 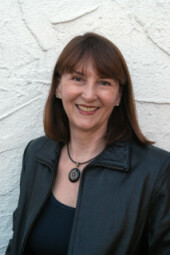 Her short stories have appeared in many venues, both print and online, and her first full-length mystery, Sweet Man Is Gone, was published by Five Star/Gale/Cengage in 2008. Inspired by her experiences playing guitar, the book is set in the world of a struggling blues band and features a blues-singer sleuth: Elizabeth “Maxx” Maxwell. Kirkus said, “Maxx’s debut has a real feel for the bar-music scene and a gutsy, believable sleuth.” The sequel, Got No Friend Anyhow, appeared in January 2011. Peggy is currently writing the Knit & Nibble mystery series for Kensington Books. Set in the charming (fictional) town of Arborville, New Jersey, the series features amateur sleuth Pamela Paterson, founder and mainstay of the town’s knitting club. The first book in the series, Murder, She Knit, appeared in March; Died in the Wool appeared in August; and Knit One, Die Two is due out in May of 2019. Three more Knit & Nibble mysteries are in the works. Peggy herself is an avid crafter, dating from her childhood as a member of the 4-H Club in rural Southern California. A longtime member of Mystery Writers of America and Sisters in Crime, Peggy served on the board of MWA New York as head of the Mentor Committee. She was president of Sisters in Crime NY/TriState from 2013 to 2015 and in previous years was secretary, treasurer, and vice-president. Peggy regularly attends mystery-writing conferences and participates in conference panels. She also gives talks on mystery fiction at libraries and other venues in New York, Connecticut, and New Jersey.